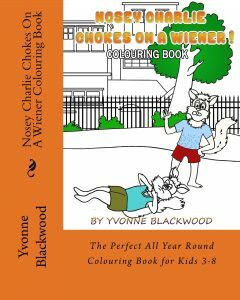 Book Dimensions: 8" X 10"
Nosey Charlie Chokes On A Wiener Colouring Book, is an exact replica of the Nosey Charlie Chokes On A Wiener! picture except that the pictures are all sketches without colour. The text of the story is included, therefore, kids will have a sense of what the pictures are about. They can unleash their creativity and colour the pictures however they like. Parents can join in the fun by obtaining a copy of the picture book and hiding it, then wait to see if the kids use similar colours. Information is supplied by the authors and posted without modification. If you have colored in this book tell us what you thought in the comments below! Post a picture if you have one!